THE STRONGEST CANNED ALE IN THE WORLD! Recently BrewDog installed their futuristic beer canning line in Ellon, Scotland where they have their headquarters. According to Brewdog the demand for canned BrewDog craft beer has been nothing short of thunderous. BrewDog founded by James Watt and Martin Dickie just a few short years ago has had a meteoric rise. This has been due to the imaginative use of marketing and iconoclastic mentality. 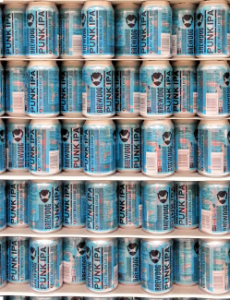 Invested in by crowdfunding BrewDog truly has a very strong and faithful following for its epic beers such as Punk IPA, Jack Hammer, Drop Dead Pony – all canned on the new canning line. Rather than just resting on their laurels they recently canned 12.7% ABV Russian Imperial Stout. The biggest ale ever consigned to metal. The highest-ABV ale ever packaged in this manner, by anyone. The batch of Black Eyed King Imp given this honour is a suitably epic one, it has been racked in first fill bourbon whisky casks and then further aged on coffee beans and vanilla pods to create a Vietnamese coffee-inspired edition. This final addition really highlights the oaky vanilla elements from the wood, and the balance of espresso and cacao adds layers of lustrous complexity to the finish, mingling with warming spicy brandy notes. Black Eye ‘Canned’ Imp is a beer to savour. The canning line was supplied by Enterprise Tondelli who were thrilled to be chosen once again to supply BrewDog. The new beer canning line is rated around 34,000 cans per hour and can produce both 330 ml and 500 ml. Martin Dickie Co- Founder said “ We like the approach of Enterprise Tondelli to our projects as they come with a very objective view to get the best result for the project rather than as a sales company. We find this refreshing as it means we work together as partners in developing various options. Also for finding solutions to some of the challenges we have had – let’s give them a beer”. There were a number of key decisions taken to reduce environmental impact and reduce energy costs the line. One was that the beer canning line does not include a traditional can warmer. Instead Enterprise Tondelli used four special air drying tunnels on the line to remove any residual water. Additionally the installation of another Baumer wraparound cartonner (already one on their bottling line) using suitable cardboard for their wraparound cartons ensures no problems from condensation. Typically a can warmer uses water, steam and requires extensive chemicals and cleaning which has been avoided by BrewDog. The beer canning line features a high level fully automatic can depalletiser from Enterprise feeding to a twin channel gravity can rinser fed by slat conveyors. The use of slat conveyors rather than traditional wire rope ensures no can damage due to can light weighting. The cans are then fed to a can filler supplied by another company before discharging to Enterprise supplied Eurosistemi conveyors. As mentioned the extensive use of highly efficient drying tunnels reduces the line footprint in what is already a very busy plant. To give sufficient accumulation before the Baumer wraparound cartonner from Enterprise an on-line accumulation conveyor system is installed. The flow through first in first out table ensures traceability for products. The unit has an on line accumulation capacity of around 5 minutes to help with efficient line running. Full line control and field wiring was part of Enterprise supply for optimum line running. The wraparound cartonner from Baumer can handle both wraparound cartons of 12’s or 24’s and also has the capability to produce high sided trays. 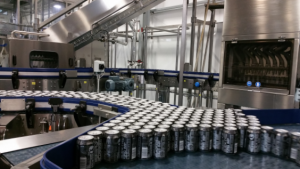 The use of high sided trays reduces the carbon footprint of the product as there is no shrink film wastage and gives easier point of sale access to the world’s strongest canned ale. For future proofing the Baumer can also incorptae a future overwpper and shrink tunnel should some markets require this. A low level pack palletiser and stretch wrapper from Enterprise complete the beer canning line. The pack palletiser (same as supply by Enterprise on the BrewDog bottling line) has some innovative features that obviate can damage and maximise flexibility. The infeed to the palletiser has a special crowned conveyor for pack turning that is patented by the manufacturer’s in Italy, Fipal Srl. This means that packs are turned effortlessly without any impact. This is further enhanced by an servo controlled indexing row pattern conveyor that has no pack to pack contact and means that row spacers are not required. This improves pack handling and also has the added benefit that new formats can be added by the customer alone as no mechanical parts are required. A opening roller head deposits the layers on the pallet. An on-line rotating arm stretch wrapper from Enterprise discharges to the warehouse. Limited edition Black-eyed imp in cans and BrewDog’s many other iconic beers can be found on their website www.brewdog.com. Here you can also become an owner of BrewDog via the current share offer. Enterprise Tondelli supply from single machines to complete turnkey projects for the beverage industry. Projects include high speed shrink-wrapping to complete craft breweries to high speed bottling and beer canning lines to complete beverage factories. Working in the beverage field for over 35 years they have executed projects in over 44 different counties around the world.